The St. Landry Parish Jail booked 3,292 inmates in 2018. Each of those inmates was treated with respect and their constitutional rights were observed. Further, each inmate in our jail is considered a fallen human being who deserves a chance at rehabilitation and a chance to overcome the challenges that caused them to fall in the first place. Our jail offers each inmate programs to defeat alcohol, drug and gambling addiction, and each inmate is offered a chance to participate in our HISET program, wherein they can earn a high school degree while they are behind bars. 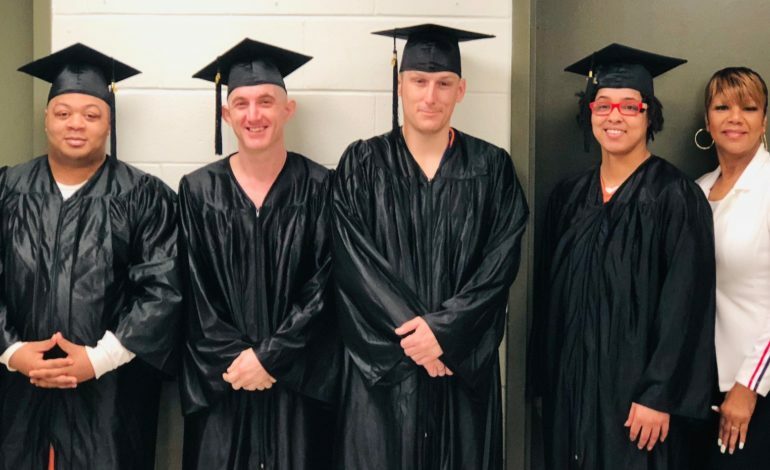 Sheriff Bobby J. Guidroz stated, “I am proud to announce the graduation of four more St. Landry inmates through our HISET program.” The HISET (High School Equivalency Test) is an educational program offered to male and female offenders housed at the St. Landry Parish Jail who have not received a high school diploma. The program helps to improve lives of inmates through high school equivalency credentials that prepare them for employment and promote changes. The new HISET test which replaced the original GED test last year is more in line with common core standards. Each student is required to participate (10) ten hours a week for at least (3) three months according to their level of education. These hours are mandatory to become eligible in achieving a HISET diploma. Lillian Rideaux, the HISET instructor of the sheriff’s office stated, “There are over 34 students who have graduated through the HISET program and currently 25 inmates enrolled in the taking courses.” Previous inmates were tested on the 9/10 LOCATOR Exam which is an exam to locate their educational placement level in the class. They are then tested on the 9/10 TABE Exam which is an exam to determine their growth of education and the preparation for the HISET testing. Beginning July 2018, the Department of Public Safety and Corrections announced the HISET program has been upgraded to a higher level educational testing implementing the 11/12 LOCATOR and TABE Exam. Each student is required to participate 15 hours a week and 30-40 hours between testing. The DOC has added a new program named “Career and Technical Education” to the HISET program. All inmate students who have completed the HISET program or have received a GED or High School Diploma and are currently incarcerated can fill out a pre-screening form to qualify to enroll in the CTE programs which are: welding, heavy equipment operating, carpentry, and office systems. The student inmates become trained, certified, and placed in on-site jobs in their field of training. Sheriff Guidroz added, “Earning a High School diploma improves an inmate’s chances of not returning to prison and becoming a productive member in society”. The additional photo has Warden Brandilyn David standing with graduates.